What’s more powerful than Qualcomm’s mid-range Snapdragon 660 processor, but not quite as powerful as the top-end Snapdragon 845 chipset? The answer is apparently Qualcomm’s newest mobile processor, the Snapdragon 710. This is the first model in the new Snapdragon 700 Mobile Platform series. Qualcomm had unveiled this line-up of processors at the Mobile World Congress in February 2018. 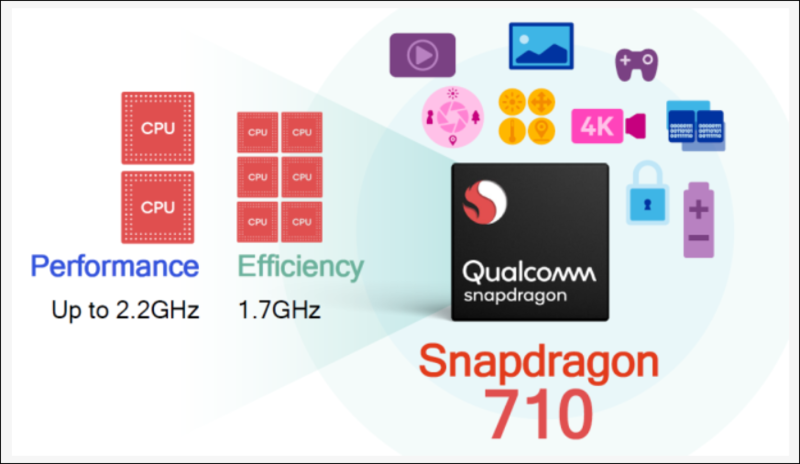 The Snapdragon 710 is a direct successor to the Snapdragon 660 but comes with a new branding worthier of the increased performance characteristics of the SoC. 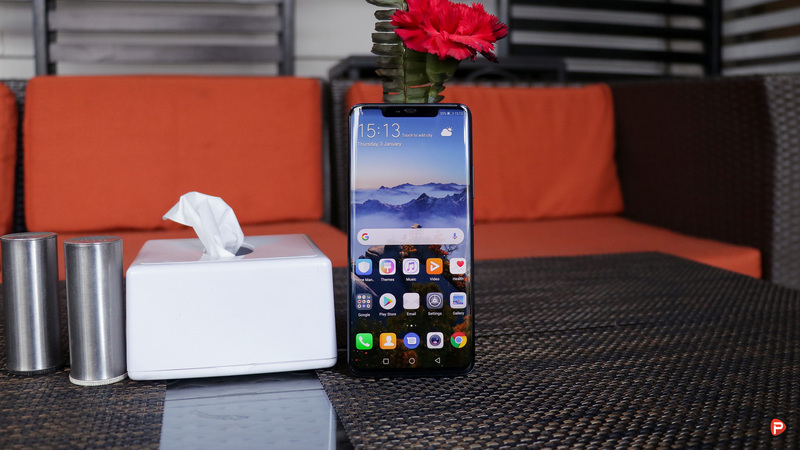 The higher-end 600 series SoCs such as the Snapdragon 650 and 660 were among the first non-flagship SoCs that used big CPU cores. This brought a significant jump in terms of performance to the mid-range processors. The Snapdragon 710 fixes this branding issue of having quite capable SoCs with large CPU cores grouped together as the 700 series. On the other hand, the lower tiered SoCs such as the Snapdragon 625 or 635 remains in the 600 series. The new Snapdragon 710 Mobile Platform is built on a 10nm manufacturing process. The SoC features a multi-core AI Engine and neural network processing capabilities. It utilizes AI capabilities to capture and share contextually-aware images and videos and personalize voice and speech patterns for more natural interactions. The Snapdragon 710 Mobile Platform’s architectures such as Qualcomm Hexagon DSP, Adreno Visual Processing subsystem, and Kryo CPU, leverage heterogeneous computing to run on-device AI applications more efficiently now. The Snapdragon 710 SoC features the new Snapdragon X15 LTE modem, a Category 15 LTE modem that supports up to 800Mbps download speeds. 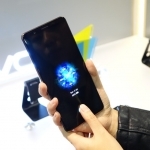 It also includes 4×4 MIMO technology for up to 70 percent faster download speeds in weak signal conditions, says Qualcomm. 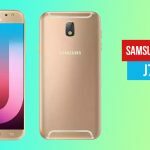 The processor also offers new Wi-Fi features, Bluetooth 5, Qualcomm Broadcast Audio, and Qualcomm TrueWireless Stereo Plus. In terms of display features, the Snapdragon 710 SoC supports 4K HDR playback for viewing HDR videos and apps. This is a new feature for processors other than the Snapdragon 800 SoC series. It also brings more brightness, wider color gamut, and color depth to the processor. 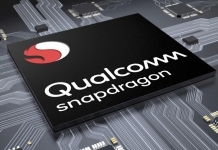 Qualcomm says that because of enhancements in the Adreno 616 Visual Processing Subsystem architecture, Snapdragon 710-based handsets can expect to see up to 40% reduction in power consumption. This is for both gaming and 4K HDR video playback! The SoC also receives a 20% reduction in power consumption when streaming video, compared to that of the Snapdragon 660-based smartphones. 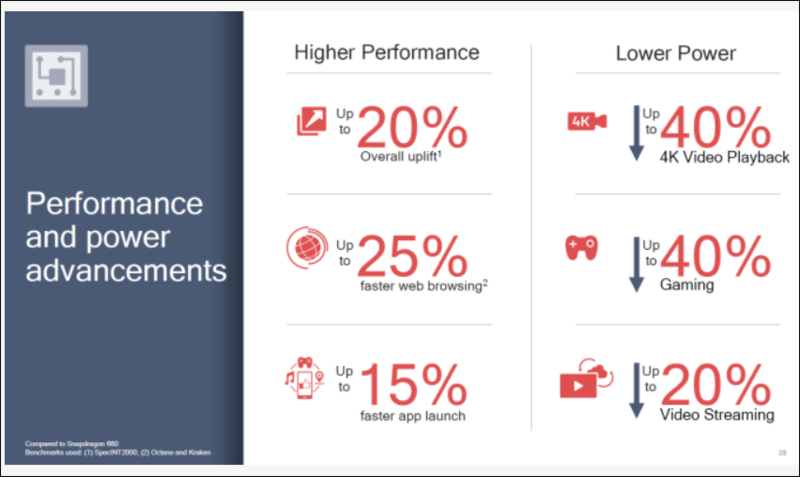 Also, the new Kryo 360 architecture, built on ARM Cortex technology, is optimized to support up to a 20% boost in performance, 25% faster Web browsing and 15% faster app launch times, the company quotes. The Snapdragon 710 SoC also comes with Qualcomm Quick Charge 4+ technology. According to Qualcomm, users can get a 50% battery charge within 15 minutes. 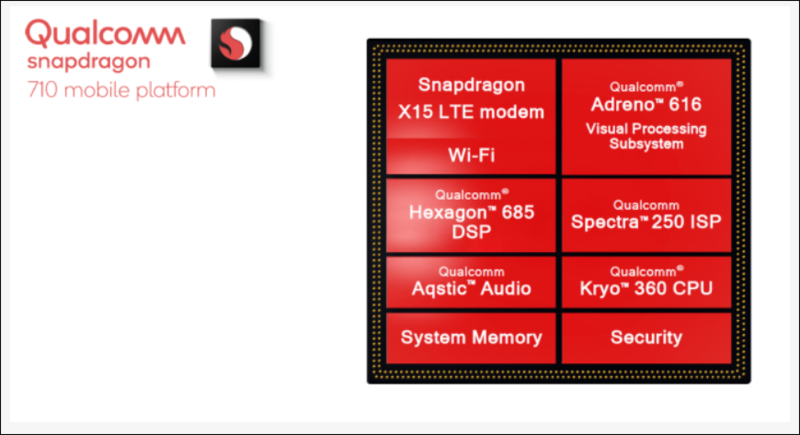 The new Snapdragon range promises to offer features and performance that were previously exclusive to the premium Snapdragon 800 series. The Snapdragon 710 is the first mobile platform in the new 700-tier portfolio. As per an earlier report, Xiaomi may adopt the processor in two of its upcoming smartphones. 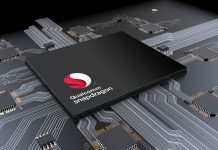 The Snapdragon 710 is currently available to Qualcomm’s customers such as mobile manufacturers and other device manufacturers, and consumer-ready products. Qualcomm expects consumer devices to be launched in this second quarter – meaning we’ll likely to see some vendor announcements soon. Thank you for reading! For more news on the Qualcomm Snapdragon 710, like our Facebook page and subscribe to our Youtube channel. If you have any questions or confusions, please feel free to ask them in the comments down below. We will answer them as soon as possible.